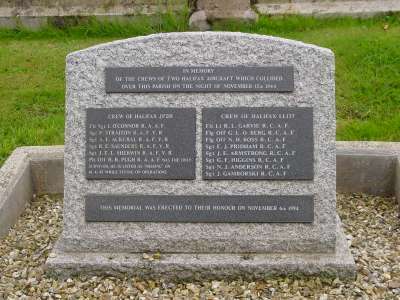 This small Devon village contains a granite memorial, dedicated to the servicemen in two Halifaxes from Nos 1664 and 1666 Heavy Conversion Units which collided in mid air, leaving no survivors." "1666 HCU (Heavy Conversion Unit) was where the crew learned to operate four engine bombers that they would fly with their operational squadrons. It was at this point that Flight Engineer William Desborough of the Royal Air Force would join the crew. The activities at the HCU were similar to those at the OTU only with larger more powerful aircraft. The crew would also learn survival and escape and evade tactics. Aircraft used at the HCU were older discarded Halifaxes such as the MkII." It should be noted that training at OTUs and HCUs was in itself quite hazardous. There was a multitude of accidents, ranging from mid air collisions to crashes on take off. The aircraft used by training units had survived operational tours and were deemed too rickety to use operationally. The Memorial to the crews of two Halifax bombers erected by the parishioners of Morchard Bishop. The Memorial stands in the centre of the village next to the War Memorial. 29520 Flight Sergeant Ian O'Connor of the Royal Australian Air Force, 61 Base*. Born 8 May 1916 in England. Enlisted in Babakin, Perth, Western Australia 20 December 1940. Named his next-of-kin as E. Luck. Died 15 November 1944 aged 28. Buried in Haycombe Cemetery, Bath. *61 Base was the training base for No. 6 Group - an organization of Royal Canadian Air Force (RCAF) bomber squadrons which operated from airfields in Yorkshire. 1825366 Sergeant (Air Gunner) Peter Straiton of the Royal Air Force Volunteer Reserve, 640 Squadron,. Son of Peter and Janet Davidson Straiton, of Glenshee. Born in 1925. Died 15 November 1944 aged 19. Buried in Blairgowrie Cemetery. 1595296 Sergeant (Flight Engineer) Alfred Edwin Ackcral of the Royal Air Force Volunteer Reserve, 640 Squadron. Son of Albert Edwin and Lydia Ackcral, of Redcar. Born in 1923. Died 15 November 1944 aged 21. Buried in Redcar Cemetery. 943666 Sergeant Bertram Eric Saunders of the Royal Air Force Volunteer Reserve, 640 Squadron. Son of Bertram and Mabel Marie Saunders, of Ewell; husband of Winifred Eileen Saunders. Born in 1918. Died 15 November 1944 aged 26. Buried in Streatham Park Cemetery. 1583794 Sergeant (Navigator) John Edward Loos Sherwin of the Royal Air Force Volunteer Reserve, 640 Squadron. Husband of Cecilia Andrae Sherwin, of Coundon, Warwickshire. Born in Coventry in the December Quarter of 1915 aged 29. Buried in Haycombe Cemetery, Bath. Pilot Officer Harold Kenneth Pugh* was the only survivor of this air accident. Subsequently, he was listed as missing on 18 April 1945 while flying on an operation. 415916 Flying Officer Hugh Kenneth Pugh of the Royal Australian Air Force attached to 640 Squadron. Son of Frank Reginald Hendy Pugh and Lavinia May Pugh; husband of Edith Myrtle Pugh, of Leederville, Western Australia. Born 25 May 1920 in Perth, Western Australia. Died 18 April 1945 aged 24. J/8362 Flight Lieutenant Robert Leslie Garvie of the Royal Canadian Air Force. Son of Arthur and Jenny Garvie; husband of Mary Lee Garvie, of Detroit, Michigan, U.S.A. Born in 1917. Died 15 November 1944 aged 27. Buried in the Military Cemetery at Brookwood, Surrey. J/37812 Flying Officer (Air Bomber) Gilbert Louis Erg of the Royal Canadian Air Force. Son of Oscar E. Berg, and of Claire Berg, of Vancouver, British Columbia, Canada. Born in 1917. Died 15 November 1944 aged 27. Buried in the Military Cemetery at Brookwood, Surrey. J/23705 Flying Officer (Navigator) Norman Holmes Boss of the Royal Canadian Air Force. Son of Abner Holmes Boss and Sadie Mary Boss, of Nelson, British Columbia, Canada. Born in 1919. Died 15 November 1944 aged 25. Buried in the Military Cemetery at Brookwood, Surrey. R/274918 Sergeant Ernest James Pridham of the Royal Canadian Air Force. Son of Harold George and Kathleen Pridham, of Kingston, Ontario, Canada. Born in 1926. Died 15 November 1944 aged 18. Buried in the Military Cemetery at Brookwood, Surrey. R/202580 Dergeant (Flight Engineer) Jack Edward Armstrong of the Royal Canadian Air Force. Son of James H. Armstrong and Myrtle A. Armstrong, of Vancouver, British Columbia, Canada. Born in 1921. Died 15 November 1944 aged 23. Buried in the Military Cemetery at Brookwood, Surrey. R/121488 Sergeant (Flight Engineer) Gerald Frederick Higgins of the Royal Canadian Air Force. Son of Frederick Robert and Minnie E. Higgins, of Marysville, British Columbia, Canada. Born in 1923. Died 15 November 1944 aged 21. Buried in the Military Cemetery at Brookwood, Surrey. R/193213 Sergeant (Wireless Operator/Air Gunner) Neville Joseph Anderson of the Royal Canadian Air Force. Son of Andrew and Emma Anderson, of Hamilton, Ontario, Canada. Born in 1922. Died 15 November 1944 aged 27. Buried in the Military Cemetery at Brookwood, Surrey. R/149180 Sergeant John Gamborski of the Royal Canadian Air Force. Son of Mike and Annie Gamborski, of Halfway Lake, Alberta, Canada. Born in 1920. Died 15 November 1944 aged 24. Buried in the Military Cemetery at Brookwood, Surrey.